It’s only October 3rd and I’m ready to declare, “I’m aware of breast cancer.” I’m aware of it without needing to see pink ribbons everywhere and pink cleats on NFL players and yogurt tops and “race for the cure” and “Susan B. Komen foundation” on T-shirts and signs and buses. I’m aware of breast cancer without all this marketing the same way most Americans are aware of it: we know someone who has it or had it. In fact, breast cancer is the way I plan to die. So until then, can I please live through Octobers and every other month without being inundated with breast cancer paraphernalia? I’m not against finding a cure – by all means, find it! Preferably in the next twenty years before I’m diagnosed with it. But while finding a cure, let’s stop acting like breast cancer is the only cure we’re in need of finding. How about a cure for AIDS? Heart disease? Skin cancer? I don’t even know what colors those ribbons are because those diseases aren’t parading around like they’re the King of Diseases and the only cure in need of finding. I know I still have four more weeks in October and the rest of my life to continue seeing and hearing “breast cancer” like it’s the source of the Apocalypse. 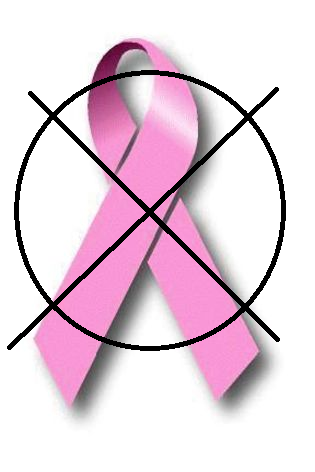 But damn it if I’m not going to voice my hatred for pink ribbons in the midst of it. I agree with you. So much of the year seems bathed in pink ribbons. Yes we need to raise awareness but you are right, plenty of other causes need highlighting too. it isn't even the disease that is the leading killer of women in the USA, yet alone the disease that is the leading killer of any human in the world, but you sure would think it was the way it is marketed. i am not going to lie, i look forward to seeing what products release themselves in a new pink color in october… i am hoping for a single serve coffee maker (like keurig) this october. i happen to love pink, and my love for it has nothing to do with breast cancer. I agree! My mom always gets irritated with the breast cancer stuff in October. We are aware of breast cancer! Amen! I've thought this for years as well. It's a reason to make all products pink and an excuse to advertise 'cute' sayings about bewbies. Nice exposure for the kids out there. Reading the story 'Susan G. Komen Foundation Elbows Out Charities Over Use Of The Word 'Cure' makes it even worse. Good blog! Well said! FYI, for every one woman that dies from breast cancer, ten die to heart disease…. It's a red ribbon! Ever seen one? I thought not!